A few weeks ago we spent the weekend with Krista's family at their new vacation home in Preston, Idaho (Granny O's hometown). While there, we visited Ava's great grandparents on Krista's mom's side of the family. 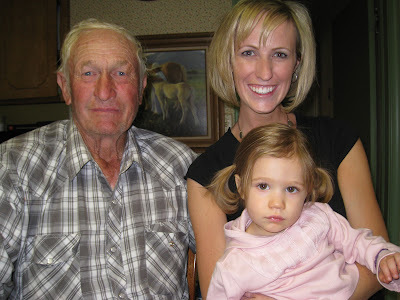 Here's Krista and Ava with Great Grandpa Beckstead. 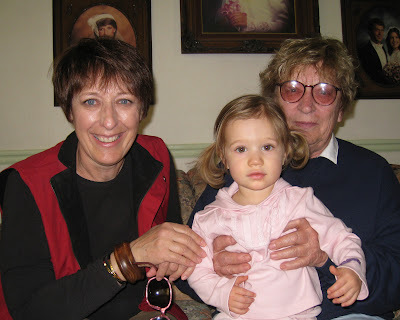 And here's Ava with Granny O and Great Grandma Beckstead. The Becksteads live on a cattle ranch, so Ava got to see a lot of livestock. However, Ava's favorite part of visiting the Beckstead farm was chasing their many little kittens around the yard. She's so cute...getting so big!! I love her long hair!! Looks like a fun time...and how fun for Ava to see the animals!! How nice to have great-grandparents around! Sounds like it was a lot of fun. Your mom is a good sport to be in the pics. I always have to beg my mom, and then she always makes weird faces! Oh that would have been so cute to watch Ava chase little kittens around! I wish I had so many great (great)grandparents like you guys!